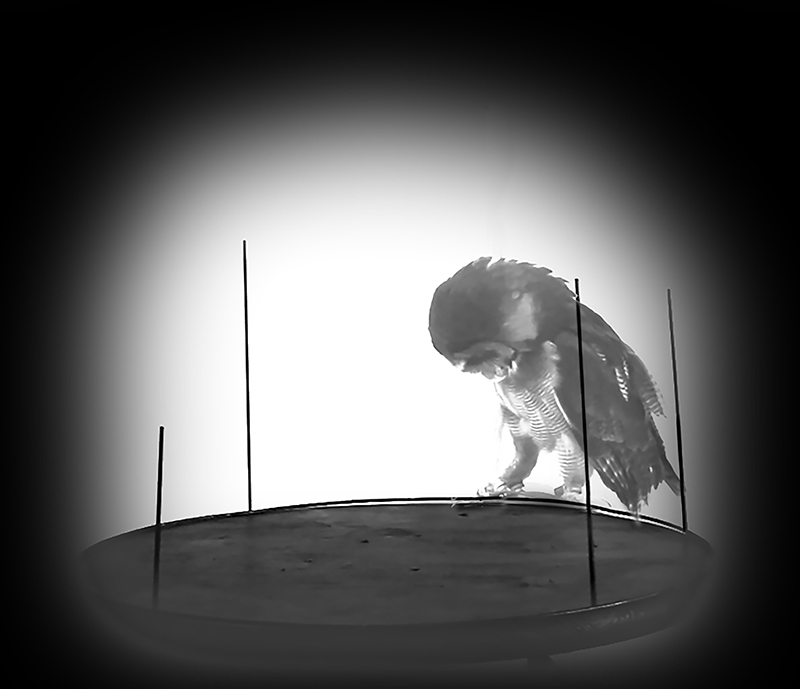 Video sequences of birds are projected onto a rotating metal frame, such that the video images overlap with the silhouette of the rotating metal bars. The video images appear for just a moment and disappear. The animals are deprived of their entirety and are visible only fleetingly. Ursula Palla's work often circles around the relation between human and nature, time and space. Again and again she combines physically present objects (bars, small sculptures) with ephemeral video images. She thus shows the contradiction between the world as it is in reality and our imagination of it, which also determines our gaze. Talking to the moon is about the question of which areas we assign to animals. A metal wheel from which four vertical bars rise up rotates haltingly. From time to time a video projector makes shadows reminiscent of birds appear over these bars. In our everyday life we also often perceive birds in a similarly fragmented manner, as they scurry through our field of vision, hardly noticed. We think we know them but know little about them. Nonetheless, through our civilization we assign these animals a habitat, such that they hardly find space, neither in the sky nor on the earth – as in the installation, where they can neither fly properly nor really land.